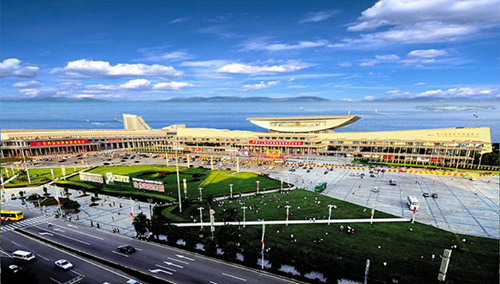 Xiamen international conference and exhibition center will host the ninth BRICS Summit in Xiamen, East China’s Fujian Province on Sept 3 to 5. In 2017, the BRICS nations embarked on their second decade of international cooperation. Recent trends in globalization have posed new challenges creating an urgent need for BRICS to strengthen its cooperation mechanism. A review of the development and evolution of the international system in past centuries reveals that globalization at different historical stages has had different developmental states—fast, slow, smooth and winding. The development of globalization is primarily affected by two factors: the development cycle of the global economy and the influences of the dominant powers, which have significant influence on international relations. Many important economies in the world have been experiencing sluggish economic growth since the international financial crisis beginning in 2008. Protectionism is increasingly evident in all kinds of visible and invisible activities of trade and investment. Many developed and developing countries are also adopting measures to stimulate domestic trade and the local economy, such as export subsidies, government procurement policies favoring local enterprises, publicity for local brands, favorable financing, anti-dumping investigations as well as corporate welfare. At the same time forces that are hostile to globalization in key countries have become more powerful. Brexit in the United Kingdom, the rise of Trump in the United Sates and the popularity of populism in Western countries are all prominent manifestations. Present-day globalization is at a key historical turning point from the perspectives of both development cycle of global economy and the influences of the dominant powers in the international community. BRICS is the product of globalization and has a reciprocal relationship with it. Globalization drives the development and expansion of BRICS, which in turn promotes globalization. In the near future, BRICS will become one of the important engines for the next round of globalization and a new type of global governance. The BRICS countries have different strategic values and interests in BRICS cooperation. In the context of globalization, Russia and China have the strongest motivation for promoting reforms to the international order via BRICS cooperation. However, Russia places greater emphasis on the political significance of BRICS, whereas China is more focused on economic aspects. Hence, these two countries differ in their views about pace and direction when it comes to establishing BRICS cooperation mechanisms. On the other hand, India is using BRICS cooperation as leverage to achieve a favorable position in both Western and non-Western countries. Brazil and South Africa have relatively small-scale economies and are located far from the rest of the members. These two countries tend to prioritize international cooperation in regions where they are. In recent years, BRICS countries have adopted different attitudes toward threats from Western countries and terrorism as well as diverging stances on improving the institutional level of cooperation. For example, after the outbreak of the Ukraine Crisis, BRICS members stood together to resist Western sanctions against Russia, but they also declined to take a side. India attempted to include counterterrorism against organizations based in Pakistan in the Goa Declaration. However, China rejected the idea of connecting terrorism with a specific country while Russia also had an ambiguous attitude. In the end, India failed to do so. The institutional level of BRICS cooperation is still at a relatively low stage. The absence of a standing organizational structure supervising and coordinating the existing action plans leads to insufficient institutional checks on the actions of members. The annual meetings of leaders from BRICS countries are only a mechanism for dialogue that are intended to express a unified voice and form a consensus on pressing global issues. The current achievements in BRICS cooperation are mostly limited to low-end political domains, including finance, trade, agriculture, energy, poverty eradication and climate change. The BRICS New Development Bank (NDB) and the BRICS Contingent Reserve Arrangement are the most feasible. However, these two financial institutions may face problems of efficiency and a lack of experience with credit ratings, operations and management, which all result from the model of equal rights in decision-making. Existing cooperative institutions, including the G20, Shanghai Cooperation Organization (SCO) and the Asian Infrastructure Investment Bank (AIIB), overlap with the BRICS cooperation mechanism in function and geographical scope. The participants in these institutions differ in terms of influence and benefit expectancy, which prompts them to adopt different preferences and strategies toward cooperation mechanisms, creating competition with BRICS. As globalization slows, the economic growth of BRICS countries generally does too. This has led some to speculate that BRICS is on the decline. The domestic political changes brought by slow economic growth have weakened the BRICS countries’ sense of a common identity and perspective while dampening their enthusiasm for pushing forward cooperation. For example, both Brazil and South Africa are dealing with gloomy domestic economies and political instability. They worry that becoming overly integrated into the BRICS bloc will undermine the flexibility of their diplomatic policies, which is unfavorable to addressing the crisis and maximizing their national interests. The Temer Administration of Brazil has tried to solidify the legitimacy of its rule by strengthening connections with the United States and the center-right governments in Latin America. It is also strongly responding to left-wing Latin American governments’ criticisms of the presidential impeachment in Brazil. All these policies will weaken Brazil’s attention to South-South Cooperation and hinder the integration of Latin America. In light of the domestic recession in South Africa, the country’s scholars caution against treating BRICS as an anti-Western platform and rejecting cooperation with Western countries. They believe pragmatic and flexible diplomatic policies are the best choices for the South Africa. BRICS countries should strengthen communication and gradually consolidate cooperation mechanisms. BRICS should strengthen communication through various meetings and forums, improving cooperation efficiency and forming a joint force for development. The BRICS countries should exert a positive influence on the new global governance through the platform of the BRICS Leaders Summit on behalf of the emerging economies and developing countries. In the future, BRICS should also promote a routine dialogue mechanism between BRICS and other international organizations. BRICS countries should actively reach a strategic consensus on promoting reform in global governance. In global initiatives, China should work to amplify the voices of emerging economies and developing countries while upholding the role of international institutions, including the United Nations, the World Trade Organization and International Monetary Fund (IMF). In this way, China may help establish a more inclusive global community of interest, destiny and responsibility. China should also be active in global economic governance, improve its capacity to engage in discourse and help the international community to rationally understand China’s road of development. China should advance the world’s recognition of BRICS consensus by valuing the collective strength of the BRICS countries. The BRICS Summit will help forge consensus and deliver a common voice via declaration, grabbing the attention of the world. In addition, BRICS countries should promote reforms in the international system of financial governance through the cooperation platform of the NDB. In an age of globalization, international financial power is the most important aspect of international influence. The NDB should learn from the successful experience of the World Bank and the IMF. Together with the AIIB and the SCO Development Bank, the NDB can jointly formulate institutional policies that are applicable to all three institutions, providing better international financial services to developing countries. Last of all, BRICS should establish the “BRICS Plus N” as a regular mechanism to expand the scale of BRICS cooperation at a proper time. Globalization is currently facing severe challenges, which makes it more urgent for BRICS to expand its circle of friends and build a bulwark to support globalization. In addition, the idea of BRICS may also be expanded to BRICKS TIME at the incoming summit, which includes most emerging countries in sub-regions around the world. The “B” in BRICKS TIME represents Brazil as well as South America; “R” represents Russia and Eastern Europe; the first “I” represents India and Southern Asia; “C” represents China and Eastern Asia; “K” represents Kazakhstan and Central Asia; “S” represents South Africa and Sub-Saharan Africa; “T” represents Turkey and Western Asia; the second “I” represents Indonesia and Southeastern Asia; “M” represents Mexico and Central and Northern America while the “E” represents Egypt and Northern Africa or Arabian area. The Xiamen Summit should be an opportunity for summarizing successful experience in cooperation, designing a blueprint for future development, clarifying the direction for pushing forward BRICS mechanism and expanding practical cooperation in various fields. BRICS should strengthen cooperation with emerging and developing countries, establishing an important platform for “South-South Cooperation” with international influence. Lin Hongyu is the dean of the School of International Relations at the Huaqiao University.